Caused by: Infection with Rickettsia rickettsii bacteria transmitted through a tick bite. Humans can also become infected by squashing ticks with their bare hands. Types of ticks that spread RMSF include: the American dog tick (Dermacentor variabilis), Rocky Mountain wood tick (Dermacentor andersoni), brown dog tick (Rhipicephalus sanguineus), and the Cayenne tick (Amblyomma cajennense). “Rocky Mountain” is a misnomer, as many cases have also been reported in the eastern United States. Symptoms of infection: usually develop 2-14 days after tick bite and include: chills, confusion, fever, headache, muscle pain, rash (According to the National Library of Medicine: “usually starts a few days after the fever; first appears on wrists and ankles as spots that are 1 – 5 mm in diameter, then spreads to most of the body. About one-third of infected people do not get a rash.”), diarrhea, light sensitivity, hallucinations, loss of appetite, nausea, thirst, and vomiting. Long-term effects: Complications for patients with untreated or improperly treated infections include brain damage, clotting problems, heart failure, kidney failure, lung failure, meningitis, pneumonitis (lung inflammation), and shock. The CDC’s estimated fatality rate is 3%; this rate is higher in some states, like Arizona (10%). Treated: orally for 7-10 days with Doxycycline; Adults: 100 mg every 12 hours; Children under 45 kg (100 lbs): 2.2 mg/kg body weight given twice a day. Use of antibiotics other than Doxycycline increases the risk of death. The symptoms of RMSF may resemble those of other TBIs like Ehrlichia and Anaplasmosis. 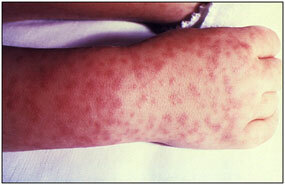 In particular, the rashes for RMSF and Ehrlichiosis may be similar. One study, published in JAMA in 1978, confirms it is possible to transmit RMSF via blood transfusion. I work as a ky forest ranger. In July of 2013 I was hospitalized for 6 days after suffering 8 days w symptoms of RMSF. Originally I got treated for a heat stroke. Many tests later Rmsf was the diagnosis and finally given the doxycycline. I suffered for over a month after with symptoms. After referred to infectious disease doctor it was discovered I had both RMSF and erlichiosis had been in my system for more than 6 months. I still get the rash(which now they call vasculitis) have confused moments and shortness of breath. Just curious if there are any similar cases and any treatments for the long term effects? I realize this post is from years ago but by chance I was wondering what happened and if you ever got over it? I have been diagnosed with the same and it’s been months and I just can’t seem to get Better! I hope you did!